Throughout the end of January, I spent some time working on this little quilt featuring the vintage Mayflower block. 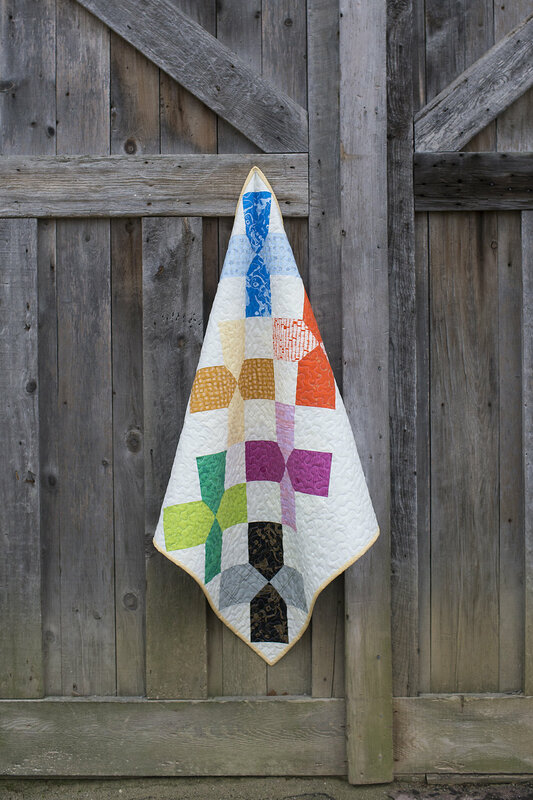 The Mayflower is one of the 20 blocks featured in Vintage Quilt Revival. I thought it was a great option to showcase those new Carolyn Friedlander fabrics that arrived last month. I combined the new Carkai fabrics with some from Carolyn's previous lines, and one purple Denyse Schmidt print from her Chicopee collection. The background of this quilt is a mixture of two white-on-white prints from Cotton + Steel. That wasn't my original plan, but I ran out of the first fabric so I had to improvise. I think it was a happy accident though! The quilt layout was inspired by another Vintage Quilt Revival pattern - my Geometric Slide quilt. I still enjoy the look of blocks slowly traveling down the quilt. My Mayflower quilt is 36" x 36", and it serves an important purpose. I created it as a base for a couple tutorials I have coming soon on BERNINA's We All Sew Blog - basting and binding. I will post here when those go live! I think they are great for beginners, but also for experienced quilters who enjoy seeing how others work.